The functional incline chest press of the ROC-IT Line of Hoist. 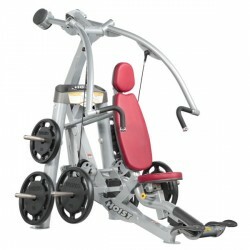 The ROX® (Ride Oriented Exercise) technology revolutionizes the fitness market. Thanks to a dynamic motion, a highest possible muscle activation is produced and fun is given while doing strength training. By tilting movement of the seat / foot rests, a healthy, biomechanically-correct accomplishment is ensured. Optimal incline chest press for gyms and open-minded sportsmen ! Let's ROC-IT® ! Maximum loadability of place to put on weights: 363kg ! When you look for a multi-gym which meets highest requirements in quality and versatility, a Hoist multi-gym is the ideal choice. Hoist multi-gyms combine all features which are expected from multi-gyms by beginners, advanced users, and pros. Either at home or at the gym - a Hoist multi-gym convinces everywhere by modern design, perfect ergonomics, and innovative functions for individual training targets. These multi-gyms offer the ideal condition for a workout fulfilling all your needs due to their complex functions. You want to make careful first steps in the world of strength training and look for a machine that is your partner? Your multi-gym should meet highest quality standards and still be affordable? You are a sportsman with high ambitions and want to train your whole body? A Hoist multi-gym is the reply to such questions. Hoist offers several possibilities from simple basic models to complex high-tech gyms in its large range of multi-gyms in order to train your body and increase your health and well-being. Depending upon the space given for your workout, you can choose between multi-gyms of different sizes. 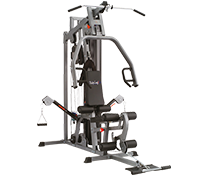 Some Hoist multi-gyms attend with technologies and functions like the 3D chest presse or the HI-LO cable pull, making your workout varied and very effective. Flexible handles or cable pulls with a rotation of 360° allow training upgrading, i. e., for Functional Training exercises and thus emphasize the versatility of Hoist multi-gyms. By means of adjusting mechanisms of high-quality workmanship with quick-release adapters, the training with an appropriate Hoist multi-gym can be easily adapted to the given conditions and characteristics of the user. It starts with the upholsteries: Hoist multi-gyms are equipped with high-quality sewn upholsteries made of special artificial leather, which provide a very high restoring force and maintain their comfort for many years. All single parts of a Hoist multi-gym are made of high-quality materials of neat and precise workmanship. Carefully welded seams and high-quality steel offer you a stability even for most intensive loads. Leg curl for strong leg muscles. No matter which muscles you wish to train at which level, free or guided, make the right decision with a Hoist multi-gym for a workout just according to your requirements.